January 20, 2012 0 comments on "Fall Toddler Craft: Thumbprint Leaves"
This fall craft is similar to a thumbprint leaf craft my older boys did a couple of years ago at library story time. The craft they did at the library used a photocopy drawing of a tree and ink pads, but this craft uses construction paper and craft paints instead. This craft is great for toddlers and preschoolers, but suitable for older children also. When I showed my older boys what their 2-year-old brother had made, they told me they made the same thing in art class in first grade. If your child likes to paint, he will love this craft. Pour a little of each paint into a paper plate. Using the scissors, cut the shape of a tree with branches from the brown construction paper. You can draw one first if you like, but it does not have to be perfect. If your child is older, they can do this part themselves. You will have to help your toddler. A preschooler might be able to cut out a shape you have traced for them. I cut out a green strip of construction paper for “grass”. You can add as many details to the picture as you wish. 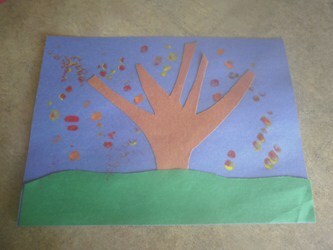 We used a blue piece of construction paper for the background and then used a glue stick to glue on the grass and tree. Next comes the fun part. Let your child dip their fingers in the paint and make “leaves” around their tree you have just made. This craft just takes a few minutes to make, but with toddlers you can only keep their attention for a few minutes anyway! And they are so proud of what they have made.